The Villa d’Este in Tivoli, with its palace and garden, is one of the most remarkable and comprehensive illustrations of Renaissance culture at its most refined. 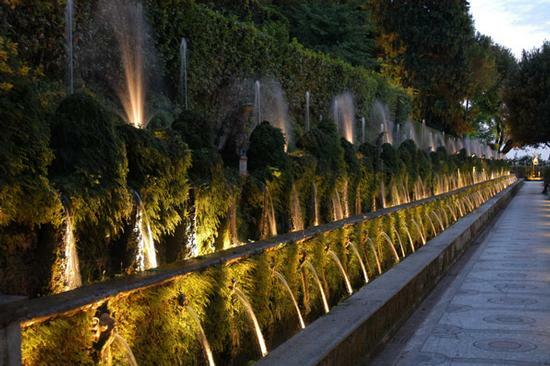 Its innovative design along with the architectural components in the garden (fountains, ornamental basins, etc.) make this a unique example of an Italian 16th-century garden. The Villa d’Este, one of the first giardini delle meraviglie , was an early model for the development of European gardens. 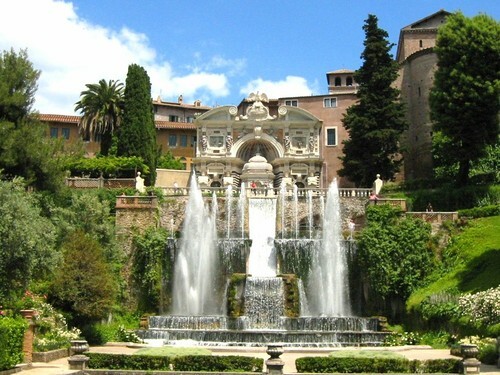 The gardens of the Villa d’Este had a profound influence on the development of garden design throughout Europe. On 9 September 1550, Cardinal Ippolito II d’Este (1509-72) arrived in Tivoli, having obtained the post of governor of the town. The official residence assigned to him in Tivoli, part of the monastery of the church of Santa Maria Maggiore, did not suit him. He therefore decided to build a splendid villa with gardens, the design of which is traditionally attributed to Pirro Ligorio (1500-83). On the garden side the architecture of the palace is very simple: a long main body of three storeys, marked by bands, rows of windows, and side pavilions that barely jut out. This uniform facade is interrupted by an elegant loggia in the middle, with two levels and stair ramps. The main rooms of the villa are arranged in rows on two floors and open on to the garden. The private apartment of the cardinal, consisting of four rooms, is on the same level as the courtyard, and the reception rooms, linked together at the back by a long corridor called the Manica Lunga, are on the lower level. The Villa d’Este garden stretches over two steep slopes, descending from the palace down to a flat terrace in the manner of an amphitheatre. The loggia of the palace marks the longitudinal and central axis of the garden. A first main transversal axis, bordering the flat part of the garden, the Peschiere, is composed of a row of three basins. At the extreme east of this water chain is the Fontana dell’Organo: it is rectangular in shape with two orders crowned by a double-scrolled pediment. The water organ, the work of Claude Vénard, was inspired by examples from antiquity: the interaction between water and air produced. Beyond the Peschiere, two staircases start climbing towards the villa. The side stairs, the Scalinata dei Bollori of 1567, are flanked by two stepped parapets crowned with basins pouring out torrents of water. Four winged dragons emerge from the middle of the large oval basin, spurting out jets of water. The parapet is ornamented with vases from which water also flows. The Alley of the Hundred Fountains is formed of three long superposed basins, its water crossing the entire garden. However, the most striking effect is produced by the big cascade flowing out of a krater perched in the middle of the exedra. Jets of water were activated whenever unsuspecting people walked under the arcades. On 9 September 1550, Cardinal Ippolito II d’Este (1509- 72) arrived in Tivoli, having obtained the post of governor of the town. The Cardinal came from the cultured background of the Court of Ferrara and had immersed himself in humanist studies. He was an erudite and cultivated art patron who was surrounded by famous artists, painters (Girolamo da Carpi, Girolamo Muziano, Federico Zuccari, Livio Agresti, etc), silversmiths and goldsmiths (Benvenuto Cellini), musicians (Palestrina), and poets (Tasso, Ariosto). He therefore decided to build a splendid villa with gardens, the design of which is traditionally attributed to Pirro Ligorio (1500-83), an antiquary and archaeologist who carried out archaeological excavations at the Villa Adriana nearby. The church and monastery stood at the top of a hill, with slopes covered in gardens, vineyards, and a few houses and churches. The cardinal, who was removed from the circles of power in Tivoli and Rome for a while because of simony (1555-59), needed a little over ten years to buy the land and demolish the buildings. Starting in 1560 great efforts were made to supply the water needed for the numerous fountains that were intended to embellish the garden. First, an aqueduct was built to capture the waters from Monte Sant’Angelo, but this source of water turned out to be inadequate and so an underground canal was dug beneath the town to harness the waters of the Anio river (1564-65). During this period the old monastery was converted into a villa and the original cloister was modified to become the central courtyard, its south-east wall being that of the old church of Santa Maria Maggiore. Cardinal Luigi d’Este (1538-86) inherited the property of his uncle but his financial resources only allowed him to complete the work already started and to carry out a few repairs. The maintenance, restoration, and layout works (the rotunda of the Cypresses around 1640) continued under the Dukes of Modena, who were related to the House of Este, until 1641. Cardinal Rinaldo I (1618-72) turned to Bernini (the Fountain of the Bicchierone) in 1660-61 and, starting in 1670, the architect Mattia de Rossi carried out more work, including changes to the palace. The period when the Villa d’Este was abandoned started with Rinaldo II (1655-1736). The situation worsened when the complex passed into the hands of the Hapsburgs in 1803. However, thanks to the work undertaken by Cardinal Gustav von Hohenlohe (1823-96), the villa was saved from what might have been an irreversible loss. In 1920 the Villa d’Este became the property of the Italian State, which initiated a restoration campaign from 1920 to 1930, and another following damage caused by bombing in 1944.